If you have a problem with Transcend Jet Flash Drives .Format it now with Jetflash Online Recovery tool For all Transcend Jet Flash Drive Series .Download it now and repair your USB Flash disk . Transcend Jet Flash Online Recovery tool is a new software tool developed to repair and format Transcend Jet Flash USB flash drives that have formatting problems and write protected problems . 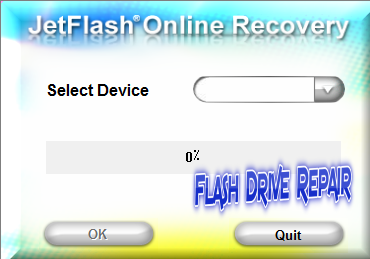 If you have a Transcend flash drive or Jet Flash drive and not working Properly so you must use jet flash online recovery tool .Transcend online recovery software has many version that suitable with every jet flash model such as JetFlash 620 ,JetFlash V15 ,JetFlash 200,JetFlash 220 .Some software needs an internet connection to perform the recovery process so make sure that you have an internet connection .Note that with using Jetflash Online Recovery Tool ,All data on your JetFlash drive will be permanently erased during the repair process. Please backup the contents of your JetFlash before proceeding. Jetflash Online Recovery Tool designed to repair malfunctioning JetFlash USB flash drives. It will not recover any data/pictures stored on the device. If you have a Transcend flash drive or Jetflash and not working properly , so What should you do ? 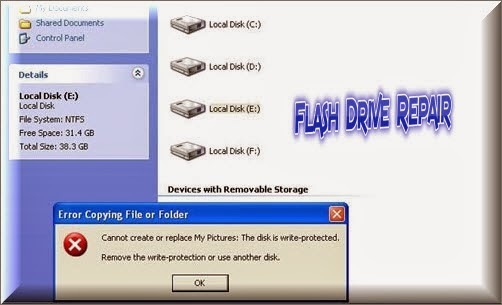 ?.There are many solutions ,you can Send it for repair, or buy a new one.But this will be useless solution,Now you can repair your Jetflash or Transcend flash disk in 5 minutes with the great tool called JetFlash Online Recovery software.Just one click and time from 2-5 minutes , you will fix your jetflash drive . When should i use JetFlash Online Recovery software ? If you got this Message when you insert your jetflash to USB port "Please Insert a disk into Drive G"
If you got the following message when you are trying to open Transcend or Jetflash drive " The Disk in drive G is not formatted , Do you want to format it now "
If you got the most common message when you are trying to copy or delete some data from Transcend or jetflash drive "Cannot Create or Replace My Pictures : The disk is write-Protected Remove the write-protection or use another disk " . Download Jetflash Online Recovery Tool from the download links in the end of this article . Insert your Jetflash drive or Transcend USB pen Drive into your PC . Open Jetflash Online Recovery Tool.exe . Your Transcend flash drive will appear on the program interface click Start to begin format process. Note that all data will be erased so be careful . Finally, when the format is complete, please press "Exit," then unplug the JetFlash and plug it back in to your computer.